The Gimbal Proximity platform enables proximity services within your application. This guide will provide examples for each of the available functions in our iOS SDK for Gimbal Proximity. These calls allow for enabling and disabling the location updates which are used to provide extra information to a sighting callback. By default location updates are enabled and need to be explicitly disabled. Important If you want to guarantee that end-users are not prompted to enable Location Services, make sure you disable location updates before you set the application ID. Note You can also use options to set different location modes when enabling location updates. The following modes are supported. .
//enable location updates. Uses Low Power location by default. This call sets up the SDK with the application ID and Secret. When you register an application on the Developer Portal the ID and Secret are generated and supplied to you. This call registers the application with the server and starts bluetooth scanning. It does NOT authorize the user of the app. The authorization protected APIs will not function unless you use "authorize" instead. Note You must add the <FYXServiceDelegate> protocol to your class. Once the service start has been attempted by calling startService: above, one of the following methods will be invoked on your delegate object once the status of the service has been determined. This call will stop bluetooth scanning. Important The SDK will no longer function properly until you call startService again. This call dissociate a device and data (visits and sightings) reported by the application running on that device. The open visits and sightings gets closed on server. Data (visits and sightings) on device also gets cleared due to this API invocation. Note You must add the <FYXSessionDelegate> protocol to your class. Once the deletion visit and sightings data has been attempted by calling deleteVisitsAndSightings above, one of the following methods will be invoked on your delegate object once the status of the service invocation has been determined. Important Visit and Sightings created before invocation of API will be cleared from device. The data on server gets anonymized due to this API invocation. The application should start a session before invocation of delete data API. The application needs to be authorized before using this API. The following configuration allows a developer to turn on the "Bluetooth is powered off" alert view. The default is to hide the alert view. Note This value must be set into NSUserDefaults before Gimbal Proximity is initialized. This call creates a sightingManager object and will trigger the callback to your delegate of sightings using the default scanning options. Using this call you will be notified of sightings for proximity devices your application is authorized for. If the user is not authorized, you can still register for the callback, but will only see beacons that are registered to the application developer. Note Be sure to add the Sighting Delegate protocol to your class. This call creates a sightingManager object and will trigger the callback to your delegate of sightings using the provided scanning options. Using this call you will be notified of sightings for proximity devices your application is authorized for. This option allows for a window of historic signal strengths to be used for a given device to "smooth" them out to remove quick jumps in signal strength. The larger the window the less the signal strength will jump but the slower it will react to the signal strength changes. This is the callback delegate for sighting notifications. Note You must add the <FYXSightingDelegate> protocol to your class. The following callback will be invoked when an authorized transmitter is sighted. temperature Temperature of transmitter in fahrenheit (optional). The value will be NSIntegerMax if no temperature sensor is present on this beacon. This call stops the callbacks to the delegate for sightings. The following configuration allows a developer to adjust the interval in seconds at which sightings are posted to the Gimbal Proximity service. The default is 5 minutes. Post sightings to the Gimbal Proximity service every ten seconds. This call creates a FYXVisitManager object and will trigger the callback to your delegate of visits using the default options. Using this call you will be notified of visit arrive, sightings and depart for proximity devices your application is authorized for. Note Be sure to add the Visit Delegate protocol to your class. This call creates a FYXVisitManager object and will trigger the callback to your delegate of visits using the provided options. Using this call you will be notified of visit arrive, sightings and depart for proximity devices your application is authorized for. Note Be sure to add the FYXVisitDelegate protocol to your class. This is the callback delegate for visit notifications. Note You must add the <FYXVisitDelegate> protocol to your class. The following callbacks will be invoked when a visit event occurs. This call stops the callbacks to the delegate for visits. 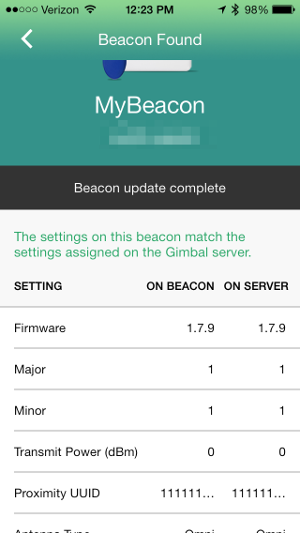 Depending on your application's use case, the Gimbal Series 20 beacon can be configured to use iBeacon technology. 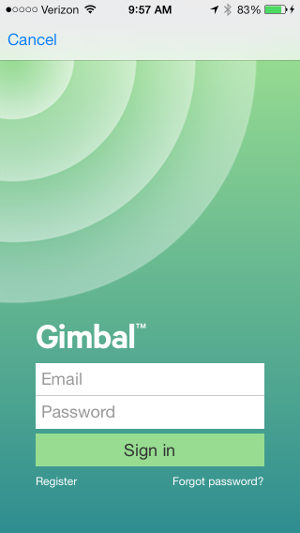 To learn how to create a Gimbal beacon with iBeacon technology please read the Quickstart Guide with iBeacon. The Proximity framework makes it very easy to use both types of beacons from the SDK and lets you manage them through the Gimbal Manager Portal. Important Gimbal SDK for iOS uses both Significant Location Change and Region Monitoring features of the iOS. In order to allow for this, an entry 'NSLocationAlwaysUsageDescription' is required. In the Info.plist file located in the 'Supporting Files' folder, add a new entry with key 'NSLocationAlwaysUsageDescription'. The value should contain a user visible string describing the app’s need for the “always” location permission. Much like a standard Gimbal beacon, you can be notified of a proximate Gimbal beacon with iBeacon technology by creating a VisitManager and set any options that suit your use case. The only difference is that you need to implement and set a FYXiBeaconVisitDelegate. Below you can see the needed callbacks for sighting a Gimbal beacon with iBeacon technology. 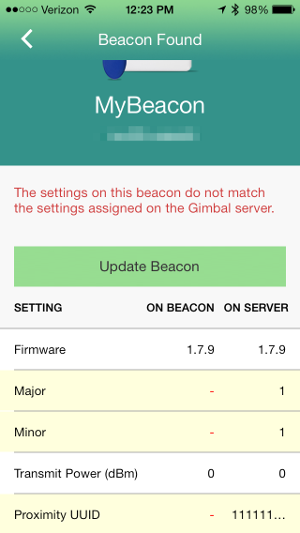 Note The SDK will only look for beacons that are managed in the Gimbal Manager Portal. Beacon Configurations allow you to customize hardware specific attributes such as antenna type, transmit power, etc, for a particular beacon. This results in having the SDK detect the presense of that beacon in different ways. For example, adjusting the transmit power of a beacon can result in a greator detection distance. Where should this configuration be used? Recommended Constant sightings in forground. Sightings in background come in at a rate of 3 per minute. Apply this configuration when timely background sightings are critical to your application's function. Presence optimized Same as Recommended, however sightings in background come in at a rate of 1 per minute. This results in a significant amount of battery savings when in constant proximity of a beacon. Apply this configuration when the user's phone will be in prolonged proximity of that beacon. This configuration will minimize the impact on the user's phone battery life when in proximity of beacons that have this configuration. Assigning a configuration indicates to the server that you want to push that configuration to the specified beacon when possible. To do so navigate to Proximity > Beacons and edit a beacon. Once logged in hit the settings button to reveal the settings menu. Click on the "Configure" menu option. Follow the directions on the screen and remove all batteries from your Gimbal Series 20 Beacon and then re-insert the batteries. 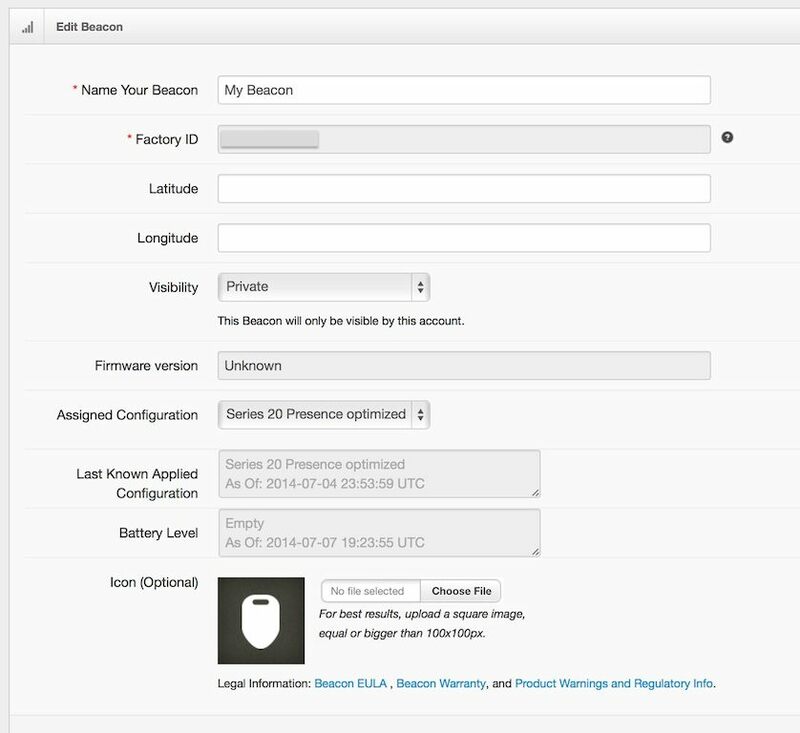 This places the beacon in a configurable mode and the application will be able to push your configuration. When connected to the beacon you should see something like the following. Notice that the configuration on the beacon does not match the configuration indicated from the Server. Push the update button to apply your configuration. This call provides the following Gimbal Proximity application information. receiverId The unique identifier for this receiver application. Null if the receiver has not registered yet. receiverOwnerId The unique identifier for this receiver's authenticated user. Null if the user has not authenticated yet. oauthToken The OAuth2 token used for authenticated requests against the Gimbal Proximity Service. Empty string if the user has not authorized yet. Add a transmitter for the authenticated user. Retrieve the transmitters for the authenticated user. Edit a transmitter for the authenticated user. Remove a transmitter for the authenticated user. Set the logging level for the Gimbal Proximity SDK. The available levels are FYX_LOG_LEVEL_VERBOSE, FYX_LOG_LEVEL_INFO, FYX_LOG_LEVEL_WARN, FYX_LOG_LEVEL_ERROR. The default logging level is ERROR. setLogLevel must be called after setting the app id, secret, and callback. Turn on file logging for SDK log calls. File logging is enabled by default. Turn off file logging for SDK log calls. File logging is enabled by default.